Last edited on 12 Feb 2015. 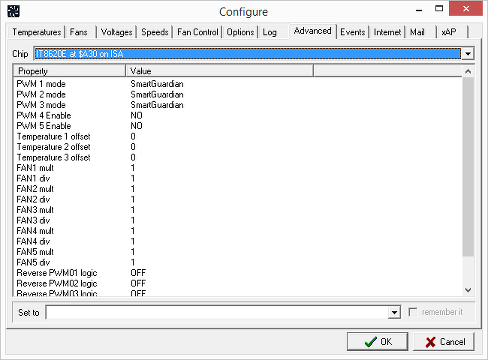 SpeedFan 4.51 added support for 5 PWM controls on the ITE IT8620E. This chip is a custom one made by ITE for Gigabyte and no datasheet was available. After several tests on multiple motherboards, SpeedFan became able to control the speed of up to 5 fans using PWM. The first 3 PWMs seem to follow the standard behaviour of other ITE chips and, depending on BIOS settings, might just need their PWM MODE to be set to SOFTWARE CONTROLLED in CONFIGURE / ADVANCED. PWM4 and PWM5, on the other hand, appear to behave differently and have no corresponding PWM MODE to set. Unfortunately, Gigabyte seems to have implemented fan control in different ways across his range of motherboards and it has been reported that changing PWM4 using SpeedFan leads to a PC power off on some of them. On many others, the majority at the moment of writing, PWM4 works great to change the speed of one of the fans. Those settings are disabled by default and will be enabled only if PWM4 and/or PWM5 will be reported as safe to use in specific motherboard models (for example, on the Gigabyte Z97-D3H they work great). By opening CONFIGURE / ADVANCED you will be presented a drop down list containing the chips found on your motherboard. Select the IT8620E: you will be presented a list of properties with their current value. PWM x MODE might need to be changed to SOFTWARE CONTROLLED to enable fan control using PWM 1, 2 and 3. 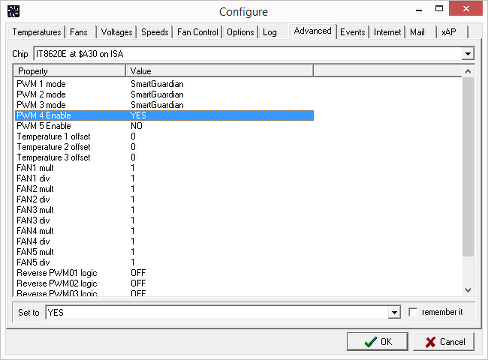 Once you select PWM 4 ENABLE, another drop down list will be populated at the bottom of the window. Select YES or NO as desired. The properties list will reflect your selection and it will be immediately active. Since you didn't check the REMEMBER IT option next to the values drop down list, your selection will not survive a PC power cycle. 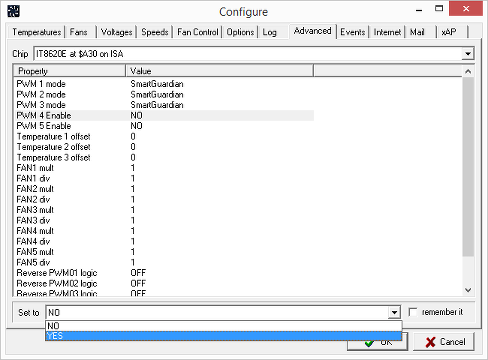 Now you can exit the configuration dialog and change PWM4 and/or PWM5 percentages on SpeedFan's main window. If nothing wrong happens and if you can change this way the speed of any fan, you can reopen the advanced settings dialog and, this time, enable REMEMBER IT for PWM 4 ENABLE and/or PWM 5 ENABLE. This way, the next time that you will restart SpeedFan, it will remember your settings and you will be able to change the speeds of your fans using PWM4 and/or PWM5 too. It would be great if you could contact me letting me know your experience with your motherboard model.